I've posted about this before. The topic comes up somewhat regularly on bulletin boards. You know, using Forge World stuff in regular games of 40k. I've decided I'm going to start using it in my Deathwing army. 1. I had a few spare points to spend. 2. I want increased options and variations for my army. 3. I want to see what people really think of Forge World. I know I may be painting myself into a corner here but that's perfectly fine with me. The more I stay in the hobby, the more I find myself appreciating stuff that is different than the mainstream stuff you see out there. Whether it be a conversion, a paint scheme or different rule, I find the stuff that is outside "regular" play (as most people describe it) to be a refreshing change of pace. Now I'm not talking about "homegrown" stuff... that stuff almost always leaves me a little leary. I'm talking about Forge World stuff in particular and other stuff you might find published by GW that could be considered "official." This won't be without it's problems though. Forge World stuff is not used at my FLGS regularly outside of Apocalypse games. I've only ever played one game of Apocalypse and that was before the rules ever came out (I think we were guinea pigs and didn't know it at the time but I can't prove that). Besides, I don't have the points for Apocalypse games. I like to stay with 1500 points. Sometimes I'll go as far as 1750 if I'm feeling really adventurous. Forge World stuff is not allowed in regular tournaments at my FLGS. I've asked before and it's a no go. And I understand too. Books like Imperial Armour aren't that easy to get ahold of (due to price and availability) and tournament organisers have a responsibility to make sure the playing field is as level as possible for all participants starting out. Now, I have an obligation to at least provide the Forge World rules for my opponent should they want to see them. This won't be a problem. I've got Imperial Armour II and the FAQ. I made copies of the relevant material so I should be good to go. We'll see how others view my list now. And for what it's worth, I'm using the Land Raider and Venerable Dreadnought rules from IA2. So that means all of the armour (over half the points) in my force now uses FW rules. As a Daemonhunters player I use FW rules, it's the only way to keep me viable If i'm honest. I'm lucky enough that the players in my local meta consider FW to be another division of GW and as such, anything published by them (in print) is legal among us. Now I dont play at a store, and I do live in the UK so both those factors will probarbly weigh in heavily. 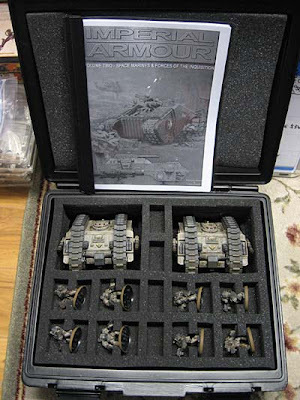 IA I tanks were a joke though, particularly once you got to 5th edition. you may like Vraks I-III though, they add bits and pieces of Dark Angels and successor chapters here and there (plus a Chaplain Dred and they have really sweet tanks). The IA II land raider variants aren't even troublesome when you compare them to what you can do to a Razorback now. I am all for FW models, on and off the table. I just wish that FW codex produce a FW codex with just the stuff you need (rules, stats, points, options, etc). That way I can get hold of the rules easily and if not play at least feel comfortable when someone pulls out the fun stuff. This is just what I have read, but it seems like you seldom get a mathhammer advantage running FW models. Anyone wanna chip in on that one? I wouldn't mind in friendly games so long as I'm given a copy of the rules or allowed to peek at their book whenever needed. Tournaments are surely another story. Personally, I dig ForgeWorld. I've even got a couple ForgeWorld models I'd like to use more often. Wow Reece who have you been playing with? As for the FW stuff I like some of the models, just wish that it was easier to get them. And not such a pain to prep them to paint. Ron, sounds like a good plan, games are meant to be fun and playing with what you would like to play with (well within the “loose” confines of the rules that is). With all the modeling and painting I've done over the last year and the limited gaming... it changed my focus of the hobby a bit. A year ago, I would have left out anything Forge World in favor of "playing it straight." I've come to value my gaming time and since it is so limited these days, I want to really maximise my games and get the most from them and what I want from the hobby. I'm definitely not as far along as you "playable army-wise," but I'm pretty much of the same opinion that if I'm going to play 40K, I'm going to have my army look and feel and play the way I want it to (within reason of course, since I'm not a power-gaming tool and want to play competitively yet FAIRLY, while having a good-looking army at the same time). Forge World stuff is a nice resource to that end: their resin figures and add-on bitz are "beautiful," their pieces are enjoyable to paint and convert with, and, owning a respectable number of their books now I'd say their rules are by and large above board and fairly comparable to "branded" GW stuff. I'm working on a (more or less) by-the-numbers 500 pt. Chaos Space Marine beginner army right now with the goal of being able to play 40K using only stuff I've modeled and painted myself, after almost 5 years back at painting miniatures with minimal gaming. The other part of my plan is to have an allied force of Renegades and Heretics on the table with 'em to represent The Shriven, from Dan Abnett's "First and Only" novel - this one is going to take some time, as most things would be converted. Ideally I'd be playing them both as a combined army in non-Apocalypse and non-Tournament games, and my thinking is that so long as I keep both forces small and not "too outlandish," most people shouldn't object. I'm thinking that the people that WOULD object are probably the ones I wouldn't WANT to play against, anyhow. What most people dont seem to realize is that after the release of the Imperial Guard and Space Marine codexes, FW released updated rules for ALL the tanks in IA 1&2 (the IG and SM books) on their website. All of these are updated to match as close as possible to the "Official" version. If someone came at me with a printed out copy of that list, Id play them, no problem. I'd have no problem playing against forgeworld stuff as long as folks have the rules with them. Thanks for linking me Ron. I am glad that I am not the only one out there trying to promote these alternative, yet balanced and fun rules.